This 3 hours long course introduces you the history, development, main building blocks and operation of the OpenStack IAAS (Infrastructure As A Service) cloud solution. It starts with a general cloud primer, continuing with the history, development and main features of OpenStack as well as its architecture and core building blocs. An important part of the training is the demonstration of the basic features and operation of an OpenStack system through its user friendly Horizon dashboard. This course covers all the core Ansible features including: installing and configuring, running ad-hoc commands, understanding modules, creating and using playbooks, variables and inclusion, task control, templates, roles as well as dealing with sensitive data via Ansible Vault. This 4 days long course teaches you the fundamentals and daily operation of the OpenStack open source IAAS (Infrastructure As A Service) cloud solution used for creating private clouds. After a short cloud and Openstack primer it presents the architecture of OpenStack and introduces its base components as well as their configuration and administration in details. 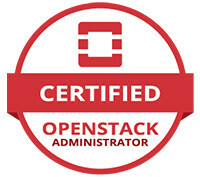 Besides in-depth theoretical coverage students also do hands-on exercises with all studied OpenStack components in their own OpenStack lab system. Linux containers are changing the way companies think about service development and deployment. Containers play a vital role in the modern data-center, and Docker is leading the way. This course covers all the core features of Docker including: container creation and management, inter- acting with Docker hub, using Docker le to create and manage custom images, advanced Docker networking (how to safely expose container services to the world, and link containers), the use of Docker volumes to manage persistent data, and Docker Compose to build multi-container applications. Emphasis is placed on best practices and how to secure Docker installations and containers. Course culminates with comprehensive labs where students use Docker, Git, and a continuous integration server to automate the testing of containerized applications. Linux containers are changing the way companies think about service development and deployment. Containers play a vital role in the modern data-center, and Docker is leading the way. And Kubernetes is the leading open-source system for automating deployment, scaling and management of containerized applications. This course first introduces students to the concepts of Docker. covers all the core features of Docker including: installing and basic management of containers, managing images and using Dockerfile to create and manage custom images. The second part of the course introduces participants to the basic concepts and architecture of Kubernetes, its initial install, setup and access control, Kubernetes Pods and Workloads, Scheduling and node management, Accessing the applications, Persistent storage in Kubernetes and finally its Logging, Monitoring and Troubleshooting facilities. This course doesn’t only prepare delegates for the daily administration of Docker & Kubernetes systems but also for the official Certified Kubernetes Administrator (CKA) and Certified Kubernetes Application Developer (CKAD) exams of the Cloud Native Computing Foundation (CNCF). The Openstack deployment and advanced administration (OST-204) training builds on the basic Openstack system administration skills gained on the OST-104 course and enhance the delegates’ knowledge with more in-depth information and hands-on exercises in the areas of realizing complex Openstack deployments, using Ceph at Openstack storage systems and implementing Openstack high-availability (HA) solutions. Besides in-depth theoretical coverage students also do hands-on exercises in their own Openstack lab system. Kubernetes is an open-source system for automating deployment, scaling, and management of containerized applications. This course builds on the of Linux container and basic Kubernetes admin. skills participants gained on our Docker and Kubernetes trainings or in practice and enhance their knowledge with more advanced Kubernetes features and extensions like Helm and Istio.